I usually don't post much about my work outside of what I make for paint draw paint. Most of the stuff here is made specifically for the site. I am going to change that up today and write a little about one of the things I like to think about as I work on my own projects. 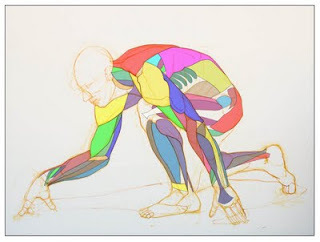 I started a new couple of paintings this week and while drawing the figure for one of those paintings I thought it would be fun to show you how I look for the anatomy in the figure and how I use it to guide my painting. One of the things I generally do is adjust the position of the figure to be a little more dynamic as I draw. Generally when a model poses, he has to maintain that pose. This can make the position feel a little static as he has to position himself in a way that he can maintain his balance. In order to get a more dynamic position I just needed to angle the legs a little more and draw his arms so as they are not so firmly planted on the ground. By doing this I hopefully give the impression that he might be rising up. Changing the positioning of the figure will change the shapes a little as muscles are stretched or compressed differently than how they are on the model we are using as reference. After I get everything positioned how I like I then work out the muscles to make sure things line up and the shapes feel right. I don't always do this and the degree to which I do can vary but, in this case, I thought it was important to figure out the shape and location the muscles fairly accurately. This is because I want the figure to be in action and that requires muscles to be flexed and engaged. To show this correctly I redraw the figure in burnt sienna with the muscular anatomy worked out. 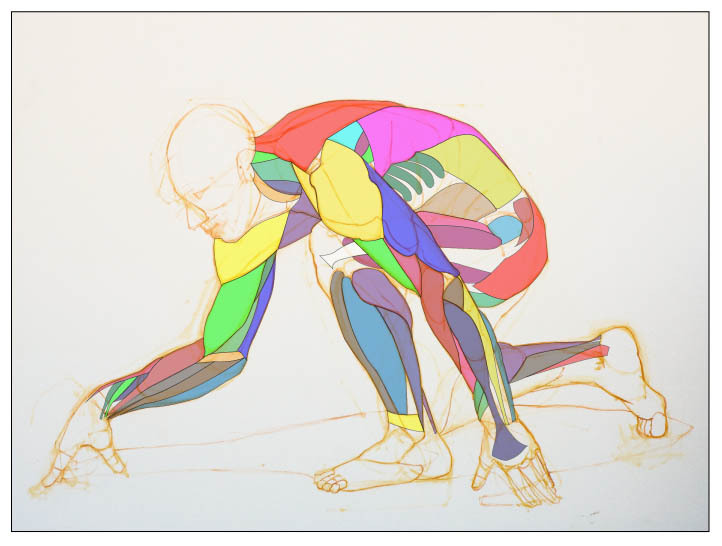 This next image shows the muscles in an overlay on top of the drawing. if you look at the image above you will see I have not drawn all the muscles. I just mapped out the ones I thought were critical to understand for the action of the subject. The next thing I like to do is mass in the shadow side and the light side of the figure. I paint the shadow as one value and color and the light side as one to three values and colors. In this case I chose three. 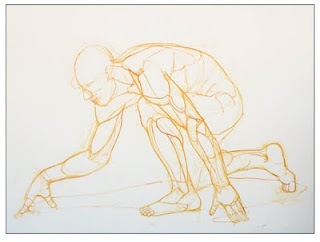 Having the muscles laid out in the initial drawing helps me find the boundaries of the shadows in the step. 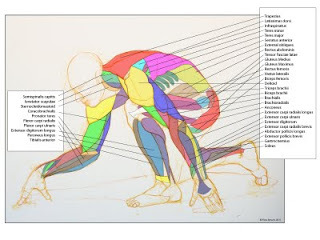 Here is the muscle overlay at this stage. 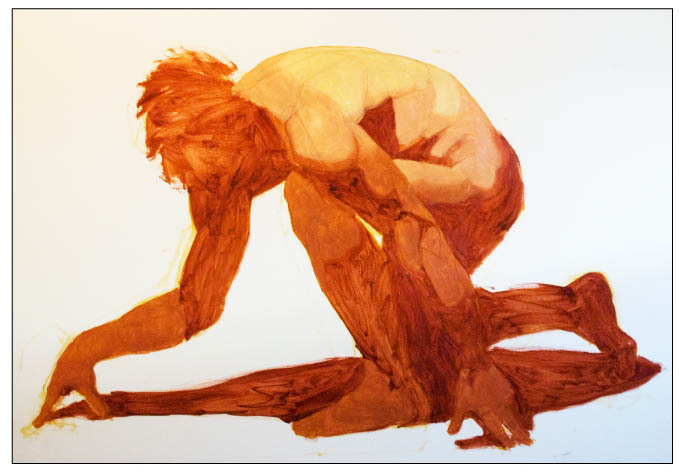 Knowing the anatomy will allow me to play and abstract the figure as I like to do. The drawing itself gets buried as I apply more and more paint to the panel, but I now have worked out in my mind what the figure is doing and how the muscles look in that action. Of course if I get stuck or have some sort of problem doing this I can always refer to my references. I keep a few anatomy books around to help me out when I need it. 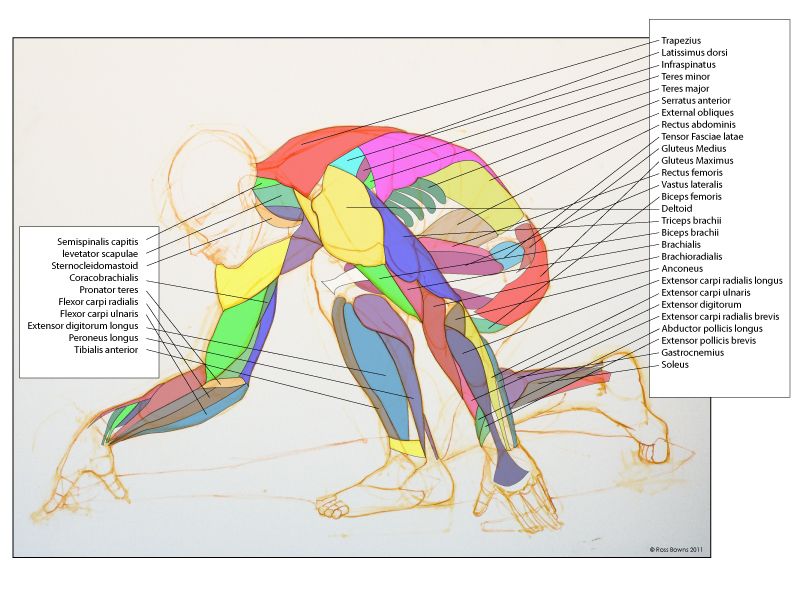 Here is the image with the names of all the muscles, just for fun. Click on the image to see the full size image. Enjoy.